Introduction: My jewelry making process like most was pure trial and error. I more took recommendations on what to use from friends and only tapped into the internet very little. I never would have guessed it would get as intricate and complicated as it did. I don't think anyone goes into jewelry making thinking that could happen (that I'm about to learn a ton and gain lots of patience). I think by default jewelry making to me sounded "fun and simple." Not that it's *not* fun and simple, but there's more to it than that! 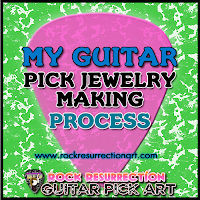 This blog entry will go over my process for making my guitar pick jewelry, the good the bad and the sticky. The first and most fun part of making guitar pick jewelry is punching them out with my Pick Punch. I make two types of guitar pick earrings; simple ones made out of colored plastic I cut out with my punch or ones punched out of other materials. What you use makes a big difference: too thin it wont punch through right, and too thick it can't punch through at all. Card board like materials are best in terms of thickness. Tissue boxes and birthday cards are a good example. After dipping in resin lots of surfaces can leak on the edge (like it got wet) or turn yellow, or become forever sticky. These are some of the things that can go wrong along the process. Usually its a good idea to to a quick and thin layer of clear nail polish before you dip it in epoxy to avoid that. Trial and error is the best way to go when you're starting. Experiment with materials a little at a time and you'll notice what works and looks the best pretty fast. Once I cut out many colorful card board pieces I glue them together with clear glue so there's a front and back design. I make sure to seal the edges with glue too. I put each guitar pick charm between wax paper with a heavy coaster on top or something flat and heavy. The wax paper makes sure it doesn't stick to itself (or the coaster). And the heavy item on top helps it glue together and dry flat and evenly. I usually leave it for 10 minutes. Don't be shy about asking other friends who do decoupage or jewelry making for tips and recommendations. Then begins the process of dipping the charms in an epoxy resin and I highly recommend you wear gloves. The type of epoxy resin you use makes a big difference. At first I tried the kind you buy in two separate bottles and mix together yourself. I would strongly recommend against this. Its SUPER easy to get the measurements off, and if they are you have to do it all over again. Also, this kind is more messy. Getting the kind in a tube that's ready to use is the best option. It comes in two separate tubes that are together and only come out when you press the tube down. The best kind I've used is "Devcon S31 2 Ton Crystal Clear Epoxy." Plus its one of the few brands that doesn't leave a gross yellow residue! Many of them seem to and its a major buzz kill! Devcon epoxy dries faster than any other ones I tried. Some take up to 2 days to fully cure, which is way too long. So go with Devcon Epoxy. Its inexpensive BUT you'll probably have to buy it online (unless you find it at a home improvement store). As far as putting the epoxy on the charm, do whatever works best for you. I would dip them and kind of saturate them in the epoxy and set them out to dry. Have them dry out of a high traffic area on wax paper on a cookie sheet or cutting board. When the epoxy is drying and settled don't touch it! Let it do its thing all the way and then it will be handle-able. If the epoxy job didn't go right you can do it again once it dries. Only once its completely dry and you're ready to use it, put it in the freezer for about 5 minutes. This helps the picks come off easily without you needing to scratch them off and ruin their surface. Don't leave it in too long or it can "un-cure" its self by becoming wet or sticky again. After that you just need to turn them into jewelry. The best way to get a hole though it is with a push pin, no need for nails. I like to put my epoxied charms though "damage tests" to see how well they hold up. They aren't meant to be torn apart but they are supposed to hold up. Mainly, did the epoxy/Mod Podge do it's job? For most of my pieces now I add Mod Podge three dimensional magic gloss. Its super easy to apply, dries in about 5 hours and leaves a perfect gloss with a pop. Just make sure to have it dry evenly on a flat surface. Edit: After using Mod Podge's 3D magic I am in love. This is now a must have jewelry making supply I want to have. Oh and don't forget to pop the inevitable bubbles that emerge with a push pin. For the final details I might trim the pick a bit or file it to make it just perfect. Make sure to put some clear nail polish on it after you're done to seal it up. When it is totally dry you can use an eyeglass cloth wipe to smooth it out and shine it up. Clear nail polish has also become one of my best craft friends, I've probably bought about 10 tubes so far (Wet N Wild make up section for $1.00 or less). Clear polishes with a blue or purple tint are great at getting rid of any yellow-y discoloration (if it occurs). I also recommend painting it gold if you have yellow spots you just can't get rid of. Another good fix is painting glitter nail polish over it or any imperfections. One piece of useful advice I got was don't be afraid to try new things. You will find better ways of doing things and will be able to refine your craft. In the end I have a beautiful, shiny, probably glittery guitar pick earring that I want to keep instead of sell. But I get over that pretty quick and greatly enjoy sending them to folks. This is literally something I do in my spare time when I'm not working one of my "job jobs." I relaxes me and is a nice contrast to my usual digital art and computer work. There's something interesting about not having a "command/ctrl z" in real life. In the graphic arts world we can make fantasy a reality always go back if we mess up. That sort of thing really doesn't exist out side of computers. In the real (non digital) art world you learn more about working with mistakes and refining your craft. So I appreciate doing both for the balance and making jewelry makes me a better graphic designer. 1) Prep your work area! 4) Trim/file off any excess material. 5) Apply thin layer of clear nail polish to both sides. 6) Dip in epoxy. You might need to do a few layers. 7) Do final touch ups with clear nail polish. Add 3D Mod Podge. Use eyeglass cloth wipe to smooth it out and shine it up when its completely dry. 8) Turn it into whatever you want! Jewelry, hair clips, whatever! Elmer's Clear Glue, Elmer's ProBond Advanced Glue, Devcon Epoxy, 3D Mod Podge, clear nail polish, wax/parchment paper, disposable gloves. Using tin foil to put the charms to dry on, it was ok at first but gets stuck more easily. Using spray can glazes instead of epoxy. Trying to apply multiple layers of clear nail polish instead of epoxy. Its really only good for a protective coat and touching up. Using Mod Podge "puzzle saver" as a hardener for the charms. Using Epoxy Resin as glue. I used a lot of different types of glues in the process of jewelry making. I also strived for something strong and that would bond well. Super glue works well but has a short setting time. Clear glue only works for gluing materials together but its not effective at all for jewelry affixing. I even tried using epoxy as glue and it really doesn't work--so don't waste your time with that. You will end of with something hardened but some stuck together. The best glue I have used so far is Elmer's ProBond Advanced Glue, it works really well, dries clear and gives you some wiggle room with set time.